Easy and trouble free in moist soil. Give lots of room. Division is difficult and not needed. Bold and showy. Goatsbeard is a large, showy plant suitable for the back of the border or used as a specimen plant in semi-shaded areas. It is a native species typically found in low-lying, semi-shaded areas. In a humus rich soil, Goatsbeard will attain shrub-like proportions with a height of 3 to 5 feet. 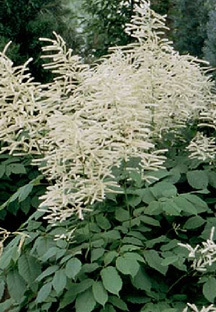 The white plume-like flowers appear in late spring to early summer; they are similar to astillbe in form. New plants should be spaced 2 to 3 feet apart. Once, established they are difficult to divide or move because of their large, woody roots. Division is not necessary but can be performed in early spring. Goatsbeard will perform well in a wide range of soils as long as moisture is adequate but is at its best in a moist, rich soil. It is trouble-free with few natural pests or problems.